I love a good salad any time of year and I especially love to play with produce of the season. Cold weather veggies like kale grows wonderfully here in Newfoundland. My parents actually grow it in their garden so I had to nab some from them (p.s. I shared some photos on my Instagram just last Friday if you want to check out the goodies). My parents were happy to share….they were overflowing with the stuff. Other delicious fall players are beets and apples so I used them here and this farro salad worked beautifully. If using pre-cooked beets (as I did in this farro salad) – I used ‘Love Beets’, which are sold in packages whereas the beets are whole, peeled and pre-cooked. This is not sponsored or anything I just love the convenience and taste of this product. Even though the beets were pre-cooked, for this farro salad, I did toss with olive oil and some s & p and roasted for a bit just to get a little caramelization. Place in a non-stick pan with a splash of water, cover and cook for a few minutes until wilted and water absorbed. I like a little bite in my kale so I don’t like to overcook. Kale chips? Yep! They’re delish! It’s basically raw kale baked. Check out Oh She Glows for the recipe and tips. Raw kale? Also good. My friend Traci from The Kitchen Girl has a wicked salad with an optional kale add-in (which I tried)—>I highly recommend this one. Ok, so now that we have the minor technicalities out of the way here, time to assemble this fall farro salad (’bout time, right??). Now, the rest is straight up easy peasy. Place ingredients in a bowl, toss with vinaigrette and serve. 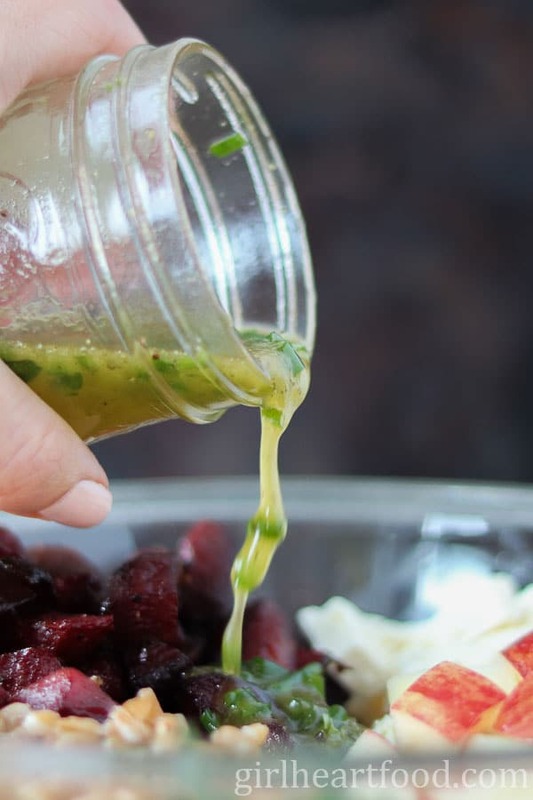 The vinaigrette for this farro salad is simply made and you basically just throw all the ingredients in a jar, cover, shake and pour. I used thyme as my primary herb here, but you could totally use your fave. Tarragon would work lovely too, especially with those beets. As mentioned above, I used pre-cooked beets in this recipe. If you are using raw, they will take longer to prepare. As the salad sits, the colour of the beets may bleed into other ingredients, particularly the feta. Not a big deal, though. The longer the salad sits, it will absorb more of the vinaigrette. I would toss with the vinaigrette prior to serving. Also – those apples. The longer this salad sits, the apple may oxidize. Therefore, if making this farro salad ahead of time and want to do some prep, you can prepare everything aside from the apples and then toss them in (along with the vinaigrette) when serving. I didn’t use ‘pre-cooked’ farro here so my cooking time was about 30 minutes or so. If you use ‘pre-cooked’ farro in this recipe, your cooking time for it will be reduced considerably. Though I didn’t use them here, walnuts would make a lovely addition in this farro salad. Hope you love this fall farro salad as much as I do! 1 lb beets -I used pre-cooked beets. See Recipe Notes below. Cook farro per package instructions and cool (typically for one cup of farro, use 3 cups of water or stock, place in a pot with a pinch of salt, bring to simmer on medium low, cover and cook for 30-40 minutes. If there is any excess water after cooking simply drain. Meanwhile, roast beets (remove excess moisture by damping with a paper towel). Toss beets in 1/2 tbsp of olive oil and 1/4 tsp each of salt and pepper. 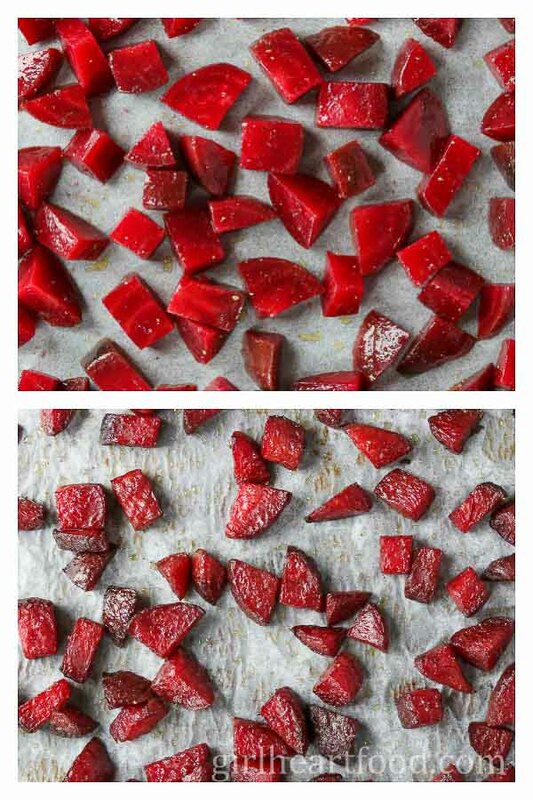 On a parchment lined baking sheet, add cubes of beets and roast on 375F for 30 minutes, turning once. Remove from oven and let cool. NOTE - see Recipe Notes Below for type of beets being used. In a nonstick pan add remaining olive oil and cook kale 3-5 minutes or until it just starts to wilt. Remove from pan. Place all ingredients in a bowl, along with dressing and stir to combine. Enjoy! Place all ingredients in a small mason jar, shake to combine and pour over salad. Also - those apples. The longer this salad sits, the apple may oxidize. Therefore, if making this farro salad ahead of time and want to do some prep, you can prepare everything aside from the apples and then toss them in (along with the vinaigrette) when serving. I didn't use 'pre-cooked' farro here so my cooking time was about 30 minutes or so. If you use 'pre-cooked' farro in this recipe, your cooking time for it will be reduced considerably. Though I didn't use them here, walnuts would make a lovely addition in this farro salad. If using pre-cooked beets (as I did in this farro salad) - I used 'Love Beets', which are sold in packages whereas the beets are whole, peeled and pre-cooked. This is not sponsored or anything I just love the convenience and taste of this product. Even though the beets were pre-cooked, for this farro salad, I did toss with olive oil and some s & p and roasted for a bit just to get a little caramelization. Hi there, should this salad be served warm? I cooked the farro, beets and kale before hand so should I heat them up again before I put the salad together? Hi Lindi, I actually served this salad cold and it was delicious. You can certainly prep everything in advance and toss with the vinaigrette when serving 🙂 Hope you enjoy! I love every ingredient in this salad. And to me, citrus dressings are best with grain-based salads. So this is perfect. Love that actually roasted the beets as well… many people “roast” beets in foil with their peels on. Thanks a bunch, Mimi 🙂 So happy you like this one! Have a wonderful week! I adore this salad Dawn! I’m like you and love a good salad year round! While summer berry salads are awesome, I love a hearty fall salad. That’s probably because local produce in Newfoundland is best in the fall. 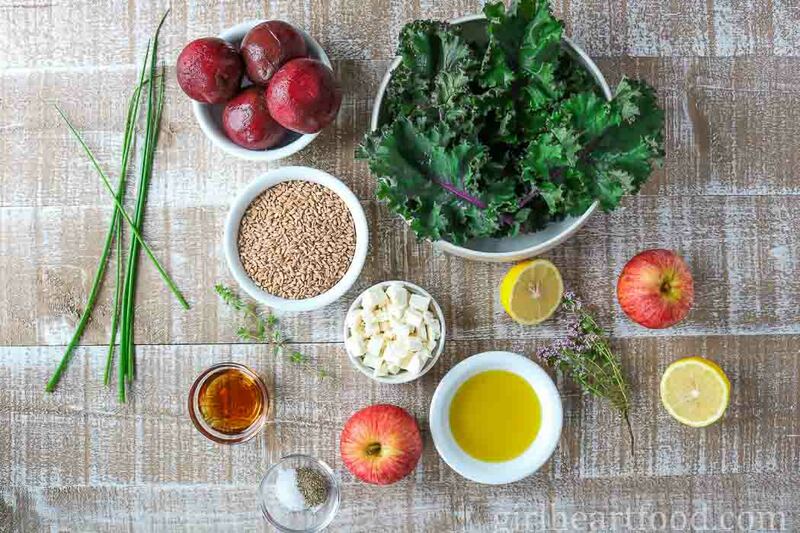 So loading up salads with local kale, beets and apples is a must! I’m pinning this to try real soon! Hope you’re having a fabulous weekend! So many flavors and textures I love dancing together in one beautiful bowl! This is the ultimate fall salad, Dawn. Just PERFECT! Thanks so much, Marissa! Love your description 🙂 Hope you’re having a wonderful weekend, Marissa. Love a good salad with beets! This looks so good!! If Fall were a salad it would be this! Love everything in this! Sometimes salads aren’t hearty enough for my crew, but this one looks like it would fill them right up! I love all the healthy ingredients and all the crunch! The apples make it a perfect fall salad. I think it would because this one is pretty hearty 😉 Thank Kathy! Hope you guys love it! I am such a fan of farro! It’s one of the truly healthy things that is actually really delicious 🙂 Such a great way to use it in the great Fall salad! How have I never cooked farro??! This looks so good- I need to get with it and go buy some! I need!!! Haha – I think you do 😉 Hope you love it, Sarah! This farro salad looks excellent, Dawn! It’s beautiful, hearty and delicious! And truthfully, I don’t mind when the beets bleed into the other ingredients! It makes it more festive and fun to eat! Oooh, that salad looks beautiful! Pinning! This is a gorgeous salad! I don’t look forward to fall to much, but with a colorful bowl of goodness like this it will sure be easier to let go of summer. And farro just has the best flavor, love have you built an entire dish around it. And whenever feta is involved, I come running. And red beats. And apples…Pinned! Farro is such a great grain! So hearty & yummy. Making a fall farro salad sounds great, and I’m always looking for new salad combos to keep things interesting! These colors are GORGEOUS and so festive! Love the contrast of colors and textures going on here. 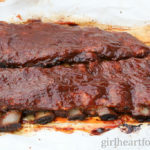 This sounds like the perfect Fall dinner idea Dawn! Love the addition of feta cheese. Can’t wait to try this one soon! Such a great salad! I love buying pre-cooked beets as I don’t have to peel them myself which saves me time and I don’t end up having purple hands afterwards 🙂 Can’t wait to try this recipe! You make a lot of epic salads but this one is my fave for sure. 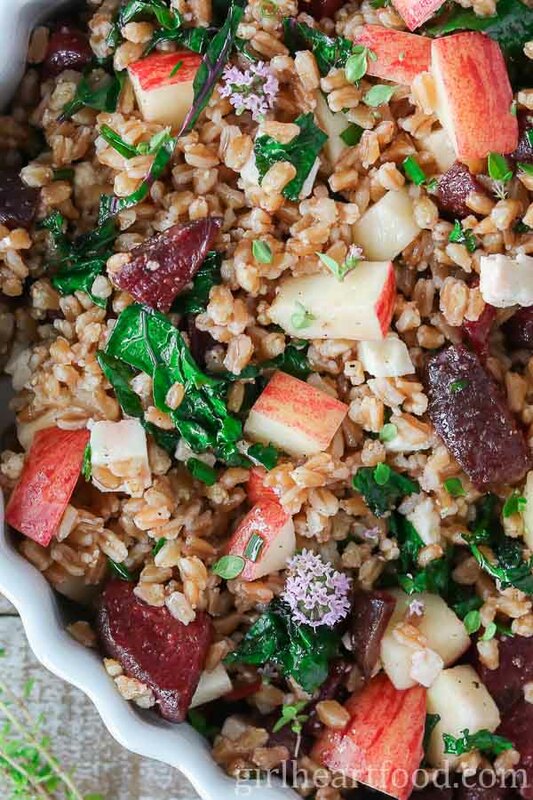 Beets, farro, apples, feta. . .it’s an explosion of my favorite flavors! I’ll have to make this one very soon. Have a great weekend! This looks like an awesome side dish, Dawn…you know, for that whole balance thing. Haha! Seriously, though, this salad is packed with all sorts of Autumn deliciousness. And that photo of you raiding your parents’ garden? Excellent! I must admit that I haven’t played around with kale much. I’ve had it once or twice, and I was never very impressed…but I need to give it a fair shake. And I’m thinking that means this salad. 🙂 Hope you have a great weekend ahead, my friend!